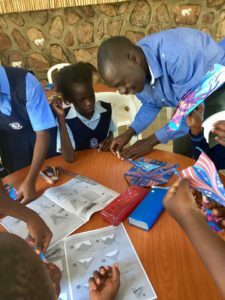 Wasswa is our newest tutor, and is doing amazing things with our children. I have trained him briefly about the Wilson Program and he tutors the children who are struggling with basic literacy skills. 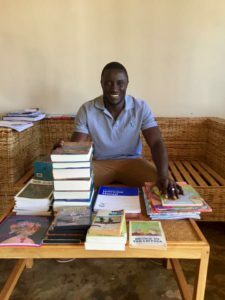 He also works to promote a love of reading by working in the library and reading picture books and novels with the kids as well. One of our older girls is working on her literacy skills by using recipes for practice with multi-syllable words. What a great way to make reading meaningful to this young woman. 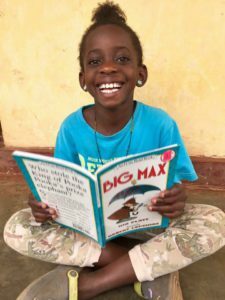 Wasswa is patient, positive and supportive – a wonderful addition to the Malayaka House family! LIBRARY: Our library continues to be a central place for all of our kids – even the toddlers take their little shoes off and come in for a story. They have special bins of board books on a low shelf. Books range from “baby books” to classic novels. Pictured above are Amina and Mary – both enjoying a book on the porch and in the central photo, you can see Shakira’s reading log. Many of the kids fill up multiple pages and when I come twice a year, they proudly show me how many books they have read. They love to give me requests for new books to add. The library is also used for daily homework time and volunteers are often available to help during that time. SCHOOL: Many of our younger students attend a wonderful school called Pearl of Africa. Pictured here is teacher Jane during a Wilson Language training, Teacher Victor during a fun paper airplane activity and me, doing what I love to do – reading stories to kids! This was an especially good story called There Was an Old Mzee Who Swallowed a Fly – a Ugandan tale with a happier ending than its American version. In addition to providing trainings for teachers, we bring much needed books and materials. The teachers are doing the very best that they can with what they have. If you have not yet become a sustaining donor, you can do so HERE today.